Catching a glimpse of the northern lights is apparently the top experience for Britons compiling a “bucket list” of must-do experiences before they die. It’s not surprising, the aurora borealis is a breathtakingly beautiful natural phenomenon, but one that is seldom seen from the British Isles. Nevertheless, on the morning of March 18, the British press were reporting a brilliant display of the northern lights the previous night. Social media was overflowing with photographic evidence of a display stretching from Scotland to Somerset. But what had brought the lights to the UK that night? The story begins in the early hours of March 15, when a magnetically active region of the Sun’s surface crackled and erupted, hurling billions of tonnes of the solar atmosphere out into the solar system. Unless you have a keen interest in our local star, you were probably unaware this had happened. It didn’t make the news. But for scientists studying how solar activity affects the space environment surrounding our planet, it was the start of an interesting couple of days. Within hours, the trajectory of this magnetised outpouring of subatomic particles had been modelled. The cloud, known as a coronal mass ejection (CME), was heading in our direction at about one million miles an hour. It looked like it would deliver a glancing blow to planet Earth some time on March 17, but what would happen if it did? 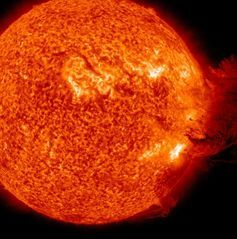 Space weather forecasters the world over set to work. A likely outcome in this scenario is that the arrival of the CME will trigger a geomagnetic storm. This occurs when the magnetic field within the CME couples with the Earth’s magnetic field, allowing energy and matter to transfer from the CME to the near-Earth space environment. The most obvious symptom of a geomagnetic storm is more intense aurora borealis due to the increased inflow of electrically-charged particles to the Earth’s upper atmosphere. But less attractive side-effects include disruption to hi-tech navigation and communications systems, and the risk of damage to satellites and power grids. Space weather forecasting, while still in its infancy, is a serious business. Spectacular lights were visible as far south as Germany. By March 16, forecasters at the US Space Weather Prediction Center were predicting the CME would trigger a geomagnetic storm in the days that followed. Then, at around 4am UK time on March 17, it engulfed NASA’s Advanced Composition Explorer (ACE) satellite, the space weather monitor that constantly samples the solar wind upstream of the Earth. For the first time since it left the Sun, it was possible to measure the orientation of the magnetic field inside the CME. The orientation of this field, the remnants of the Sun’s magnetic field torn away when the CME was launched, is crucial. It controls the coupling between the CME and the Earth’s own magnetic field. Although it can take almost any orientation, if the field inside the CME points southwards, it will oppose the Earth’s magnetic field (which, as any compass shows, points north) and these opposite polarity fields interact strongly. If the CME’s field points northward, the interaction is much weaker. The satellite revealed that the field inside the incoming CME was strong, and as it streamed past the Earth over the course of the morning, it fluctuated between northward and southward orientations, triggering mild geomagnetic disturbances. Then around noon, the CME’s magnetic field turned southward and stayed southward for the next 12 hours. The strong and sustained coupling poured energy into the magnetosphere, the region of space normally dominated by the Earth’s magnetic field, triggering the strongest and longest geomagnetic storm of the Sun’s current 11-year cycle of activity. Excited aurora-spotters all over the globe weren’t disappointed. As night fell, the northern lights, and their southern counterpart the aurora australis, lit the skies with dancing displays of green and red light. Normally concentrated in ring-like ovals that circle our planet’s magnetic poles, the auroral zones expanded equatorward, pushing auroral displays as far south as Kansas and Virginia in the northern hemisphere, and as far north as New Zealand and Australia. In the UK, those hoping to see the aurora were battling a blanket of mist and fog that settled across much of the country, but many of those with clear a view of the sky reported sightings of the northern lights. Green and purple skies about Castlerigg Stone Circle in England’s Lake District. Although the biggest geomagnetic storm of the current solar cycle, this St. Patrick’s Day storm was not a once-in-a-lifetime space weather event. 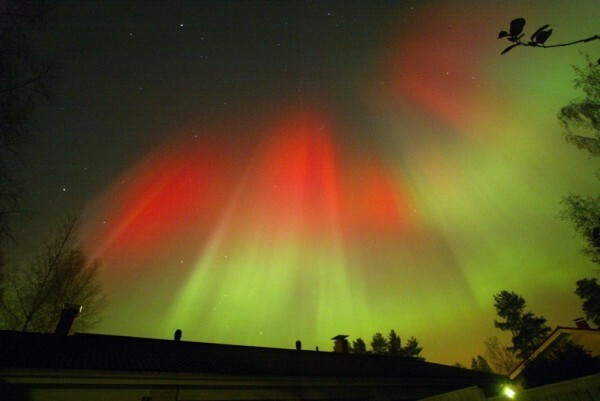 Mid-latitude aurora sightings are rare, but typically occur a handful of times in each 11-year solar cycle. The current solar maximum is not as intense as the previous peak in 2003 and the frequency and severity of geomagnetic storms has been lower. Over the coming days, high-tech infrastructure operators will look at how their systems responded to the storm, but the early indications are that there were no significant problems. So if this wasn’t a unique event, why did it make the headlines? One reason why public interest in the northern lights has increased since the previous solar cycle is the advent of social media and mobile technology. Now anyone can sign up to space weather alerts and have warnings of solar flares, CME eruptions or geomagnetic activity delivered to the phone in near real-time. Hopeful aurora spotters can find out what others in their country or region are seeing and interact with them easily, most commonly by using the #aurora hashtag. 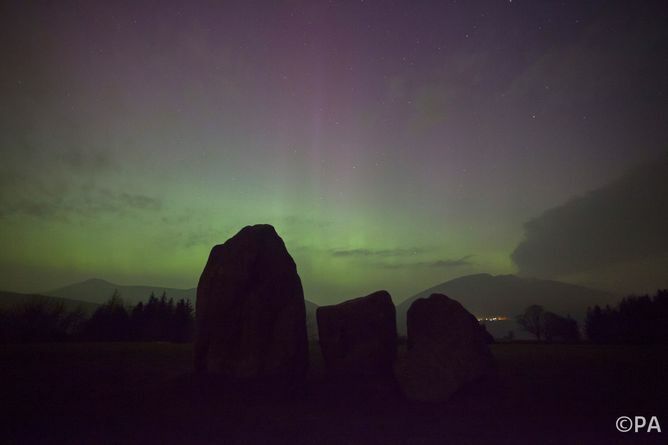 Lancaster University’s AuroraWatchUK service is Britain’s most popular aurora alerting system and uses real-time magnetic field measurements from across the UK to sense the geomagnetic disturbances associated with the northern lights. Social media channels now mean our alerts can reach huge numbers, improving the odds of people seeing the aurora from their back garden. During the St. Patrick’s Day storm, our social media posts reached more than 200,000 people, with thousands of shares and retweets. 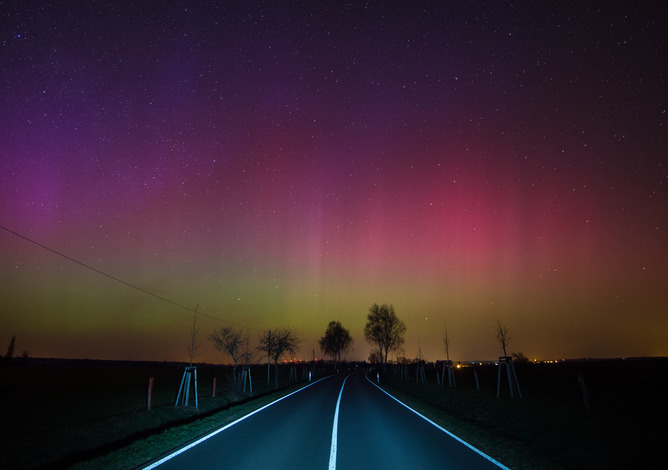 For UK-based aurora-spotters, geographic location, weather and light pollution are not ideal. But if you want to tip the odds slightly in your favour, as well as looking up, you should really think about looking at your phone.